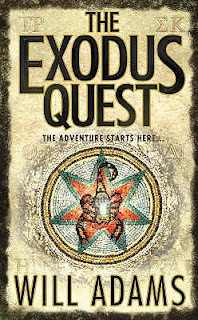 The Exodus Quest is the only Will Adams book I have read. I found the plot extremely confusing, jumping around from one location to another, and there were so many different characters I lost track of who was who and in the end I didn't really care! The author had obviously done his research but presented it to the reader in long, boring dialogues. The final few chapters couldn't come soon enough. Fact collides with fiction in Will Adams second pulse-pounding adventure featuring the enigmatic Daniel Knox. On the trail of a Dead Sea Scroll, Knox stumbles across an ancient temple being surreptitiously excavated by evangelical Christians outside Alexandria. A chase ends in tragedy with the death of Alexandria's senior archaeologist, and Knox the chief suspect. Meanwhile, Knox's partner Gaille Bonnard is baby-sitting a television crew around the ancient city of Amarna, home of the multiple mysteries of Pharaoh Akhenaten. Kidnapped by rogue soldiers, her time fast running out, she sends Knox a message hidden in a hostage video, pleading with him to come to her rescue. But Knox has problems of his own, under arrest on suspicion of murder, locked in a police cell half a country away. And the only way for him to find and save her is to crack one of the great unsolved mysteries of the ancient world.